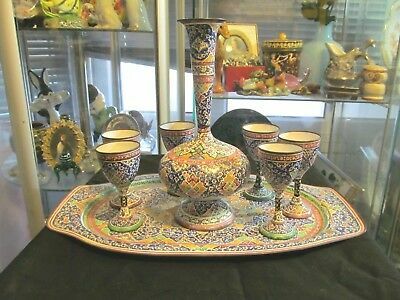 Collectible Persian liquer set,copper&enamel work,Esfahan by Zandi,flower decor. Popularity - 39 views, 1.2 views per day, 33 days on eBay. High amount of views. 0 sold, 1 available. 39 views, 1.2 views per day, 33 days on eBay. High amount of views. 0 sold, 1 available.